The RadMax diesel engine is an internal-combustion engine based on the RadMax rotary design. Due to combustion chamber geometry and the required compression ratio of 14:1 to 20:1, it will typically utilize 10 to 12 vanes, creating 20 to 24 combustion events per engine revolution. With an idling speed of approximately 300 RPM and a normal operating speed of 1,200 to 2,000 RPM, the result is a high-torque, smooth-running, lighter-weight and low-noise engine. 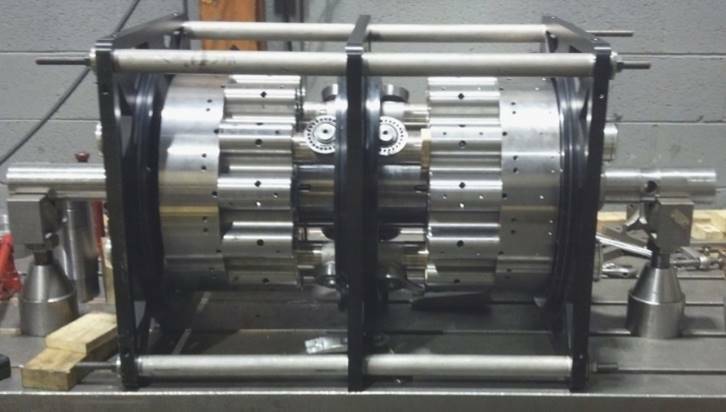 The current prototype under testing is approximately 16 inches in diameter and 32 inches long. It is expected to have a maximum 350 to 375 shaft horsepower. The RadMax internal-combustion engine design is easily scalable and diesel engines of 5,000 hp or more are envisioned. Like gasoline engines, diesel engines must mix air and fuel into a combustible mixture. Diesel engines typically mix fuel and air directly in the combustion chamber through the use of high-pressure injectors and the load on the engine. The speed of the engine is governed by the amount of fuel introduced. The diesel engine’s higher compression ratios result in greater thermal efficiency. However, even though higher compression ratios provide self-ignition and better thermal efficiency, the increased pressures and stresses require diesel engines to be stronger and stiffer than comparable gasoline engines. Given identical displacement engines, a diesel engine will typically produce less horsepower but more torque than a gasoline engine and have better fuel economy. Like conventional piston-type internal-combustion engines, the RadMax diesel engine implements the Otto 4-stroke cycle. However, a RadMax rotary diesel engine works in a completely different way. In a conventional piston engine, the same volume of space (cylinder volume) houses the four different strokes of the Otto cycle alternately: intake, compression, combustion and exhaust. A RadMax engine accomplishes these same four strokes, but each occurs in its own part of the housing. It’s like having a dedicated cylinder for each of the four jobs with the piston moving continuously from one stroke function to the next. In a RadMax diesel engine, the pressure in each chamber changes as the adjacent axial vanes extend or retract. Driven by the rotor, the ends of the vanes follow along the surfaces of the cams which approximate a sinusoidal wave. This path is uniquely designed so that during each revolution of the rotor, the volumes of the chambers alternatively expand and contract. The process is repeated in each of the chambers on each side of the rotor. The RadMax rotor spins continuously in one direction, rather than violently changing directions as with pistons in a reciprocating engine. Because the upper and lower faces of the rotor are 90-degrees out of phase, RadMax is always balanced and exhibits minimal vibration. For each specific chamber (see animation), outside air (white to dark blue) is pulled into the chamber between two vanes through the intake port (INTAKE) and compressed (COMPRESSION) to a higher pressure and temperature (blue to yellow to red). Slightly past top dead-center, fuel is injected (INJECTION PORT) and the resulting high pressure and temperature of the combustion gases force the leading vane forward in the direction of rotor revolution. As the vanes continue forward, the combustion gases expand (POWER) to a lower temperature and pressure (red to dark gray), creating rotational torque. The expended gases are exhausted (dark gray to white) through the exhaust port and the cycle is repeated. It is possible in a RadMax diesel engine to recover more energy from the expanding gases than from a piston engine by including an extended expansion volume in the engine design. With a high firing frequency based on multiple combustion events per rotation (determined by the number of vanes) and then doubled by the two cams (one on each side of the engine), the RadMax internal-combustion engine can generate more than 1 hp per pound of weight. This is approximately a 600% increase over a comparable-horsepower, diesel-fueled piston engine’s power-to-weight ratio. Because of its high torque and horsepower-to-weight ratio, the RadMax diesel engine is well suited as a prime mover for aviation, marine, automotive and truck, hybrid vehicle, and various power generation applications. Download a RadMax engine brochure here.